But one thing is for certain - it’s going to be emotional. You only need to watch some of the reaction videos on YouTube to know that GoT is not your average TV show. Favourite characters are killed off without a moment’s thought. Good guys do terrible things. Weddings are to be avoided at all cost. But as we prepare to bid farewell to the mother of all emotional rollercoasters, we thought it would be interesting to look back and consider the scenes that have made the show so popular. “The Red Wedding”, “Cersei’s Shame”, “The Battle of the Bastards” - these are all moments that have had GoT fans gripping their armchairs, gnashing their teeth and burying their heads in their hands. But which scene is the best? If a scene could sit on the Iron Throne, which would it be? Now, there’s no doubt that Game of Thrones fans could argue about this until Winter has finally come and gone. There are so many great moments from the show, it’s hard to choose just one. But one thing we can do is find out which scenes and moments generated the strongest emotions from viewers - and we don’t need a priestess of the Lord of Light to be able to do it. That’s because at Realeyes we can use our #EmotionAI technology to measure people’s emotional reactions using webcams. So we compiled 26 scenes from hit show that fans have voted as the greatest and then showed them to a panel of consumers to see which elicited the strongest emotions throughout. As you can see from the chart above, we have one clear claim to the Iron Throne - the moment at the end of season six when Sansa not only gets revenge on her husband Ramsay Snow but also manages to feed the dog at the same time. It managed an EA score of 9.5 out of 10, which is incredibly high. In second spot is a scene from season 4 which still gives me nightmares - the moment when Gregor "the Mountain" Clegane fights Oberyn "the Viper" Martell in a trial by combat (9.2/10). Meanwhile, Arya Stark getting revenge on House Frey, a scene from the sixth series, was third (9/10). Arya Stark’s first kill (S3 E10), Viserys’ ‘Golden Crown’ (S1 E9) and Cersei blowing up the sept (S6 E10) were joint fourth (7.9/10). 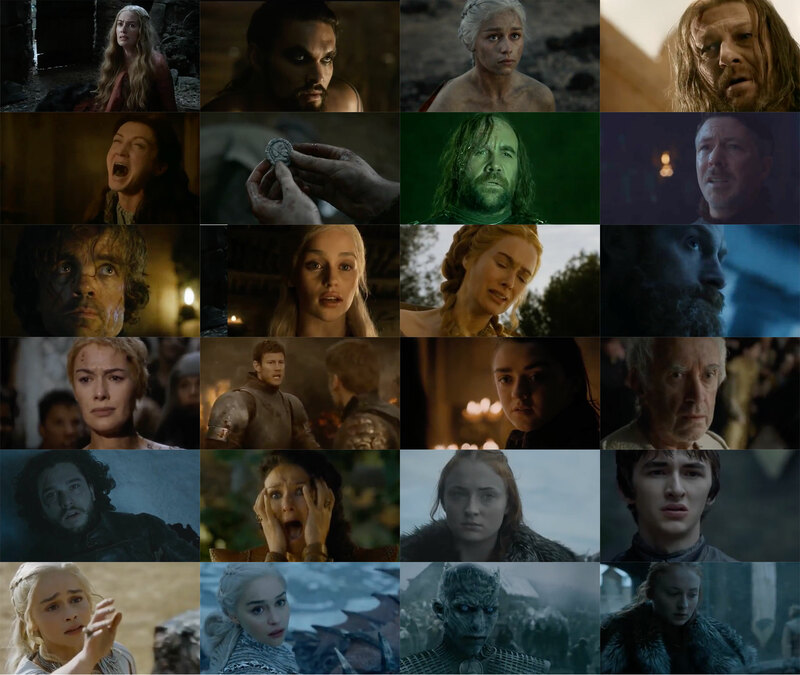 The White Walkers’ attack on Hardhome (S5 E8), Daenerys being saved by her dragon (S5 E9) and the Battle of Blackwater (S2 E9) also appeared in the top 10 most emotional Game of Thrones scenes. Surprisingly, the infamous Red Wedding scene, from season three, was down in 13th. This could purely be that Game of Thrones fans have no more emotion to give on that front. Or they are still in shock at what happened. “The Battle of the Bastards” also just missed out on the top 15. But what we have looked at so far are scenes from the Game of Thrones series - some of which are over 10 minutes long. Chart updated at 9am on Monday, April 15, 2019. As you can see, topping the list is the rather gruesome moment Gregor "the Mountain" Clegane kills Oberyn "the Viper" Martell in combat, which managed to make almost half of people (46.4%) watching visibly emotional. That puts it just ahead of Ramsay Bolton finally getting his comeuppance at the hands of his ‘faithful’ hounds, which made 44% of the viewing audience visibly emotional. Melisandre giving ‘birth’ to some kind of shadow demon was third, with 43.7%. Finishing up the top 5 is Arya unmasking herself after getting revenge on House Frey and Viserys finally getting his golden crown in fourth and fifth respectively. Other moments to make the top 10 include the Knights of the Vale saving the day at the Battle of the Bastards, Joffrey dying in his mum’s arms and Stannis’ fleet being destroyed by wildfire in the Battle of Blackwater. The Night King lifting his arms and waking the dead at Hardhome just makes the top 10. Survey: Who Will Win The Iron Throne? With the final season about to begin, we also thought it would be fun to ask study participants who they think will end up on the Iron Throne by the end of season 8. The results were pretty conclusive, with almost a third choosing Jon Snow (32%). Daenerys Targaryen was second, attracting 19% of the votes, while The Night King and ‘No One’ were joint third with 9% apiece. Who do you think will claim the Iron Throne at the end of Season 8 and win the Game of Thrones? Realeyes’ Game of Thrones research was compiled using the #EmotionAI company’s facial recognition technology, which measured the emotional reactions of 2,550 Game of Thrones fans as they watched 26 of the most memorable scenes from the TV show, as voted for in various polls. The software measures and interprets consumers’ facial expressions and body language as recorded by their webcams while watching. 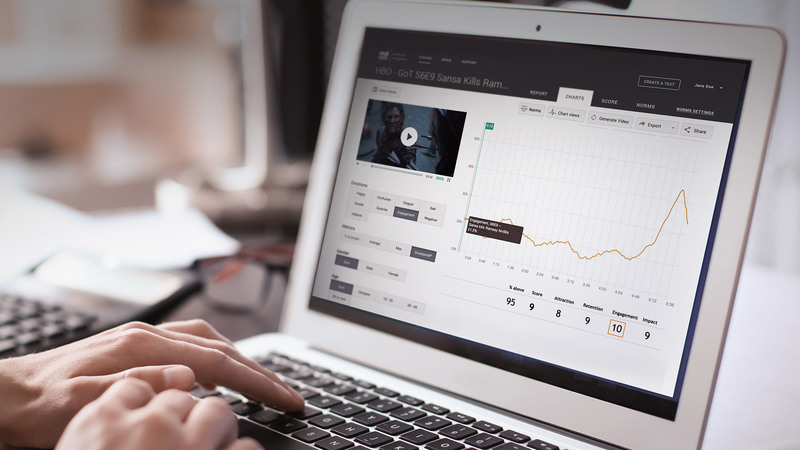 For each video, a 120-person sample audience was prompted to opt-in via their webcam to view the content. Each viewer watched the content on their own devices, representing a natural and authentic viewing experience. Realeyes’ technology then analysed the subtle facial expressions and body language of the sample audience to identify the subconscious emotional responses to the content. EmotionAll® score: A 1-10 score based on the composite of four metrics: Attraction, Retention, Engagement and Impact. These scores were then fed into an algorithm to determine an overall score out of 10. The higher the score, the more effective the ad is at eliciting strong emotional responses. Realeyes has more than 20,000 videos in its database. Participants were also asked a survey question as part of the study. So I hope this article has you in the mood and ready for Season 8. Who will win the Iron Throne? We’ll have to wait and see. The only thing we do know is the emotional rollercoaster has only just started. To find out more about Realeyes’ face-reading solutions, click here.